Your favorite flightless space birds are back and on DVD! Is your child a fan of the TV show, 3-2-1 Penguins!? 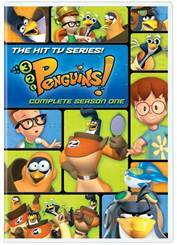 Well, if so, you will love to know that 3-2-1 Penguins!—Complete Season One is now out on DVD and it includes all 13 episodes from the first season of the top-rated series that aired on NBC. Fans and families will be able to revel in the adventures of Space Penguin Pals Zidgel, Fidgel, Midgel and Kevin as they engage their young friends Michelle and Jason to help them solve intergalactic crises with faith and fun! In addition to the episodes, the DVD will feature bonus content including “How to Draw Midgel,” “Space Academy: Speak Like An Alien,” “Midgel's Cool Blue Space Fuel,” and the “Make Your Own Planet” activity. 3-2-1 Penguins!—Complete Season One provides close to five hours of intergalactic entertainment! This is the first time families will be able to enjoy the episodes from season one back-to-back. Win It: (1) 3-2-1 Penguins!—Complete Season One to a lucky winner!